Taste the famous 'Torrontés' made of white grapes! Add in the classic lakes crossing between Argentina and Chile. Upon arrival in Buenos Aires, you will be greeted at Ezeiza International Airport by our representative and transferred to your centrally located hotel. The soul of the city bears an irresistible allure to Argentines and visitors alike; its parks, cafés, streets, theatres, museums, markets, restaurants-and its homes-the elegant, the chic, the eccentric, the everyday. This morning's excursion will introduce you to the magic of the Argentine capital. After being picked up from your hotel we start with the magnificent Northern Quarters, Palermo, Recoleta and the Colon Theatre. Next we visit ‘La Boca’, the most picturesque of all neighbourhoods of Buenos Aires. This extravagant zone is completely different to the old and to the modern Buenos Aires and romantic stories tell us that tango was born in this working class area. Continue to San Telmo Flea Market where you will find a weapons vendor sitting proudly before his display of knives, cleavers, and daggers, most of which have handles made from horn or antlers. Return to your hotel to do some last minute packing before transferring to the airport for your flight to La Rioja. Upon arrival, your will be greeted by our representative and driven to the city centre for a welcome dinner. Continue your journey toward El Chiflon, where you will spend the next three nights. Chiflón Posta Pueblo is the closest hotel to the Ischigualasto and Talamapaya natural parks in the province of La Rioja. The property has a picturesque architecture that simulates a typical mountain village, with winding corridors that go up towards the hill and decorative details in stone and dry trunks. An oasis in the middle of Route 150 that will be the base to our astronomical experience. Wake up early and enjoy your breakfast. Afterwards, take off on a drive to Ischigualasto Provincial Park. The park has an area of around 62,000 hectares and is home to a remarkable geological and paleontological heritage. It has been an UNESCO World Heritage Site since 2000 and dates back to the Triassic period over 300 million years ago. It is truly one of South America’s natural wonders. Home to the oldest known predator dinosaur, the park is a playground of rock formations, painted valleys, and other geological rock formations. Spend the afternoon exploring the park, including the intriguing Valley of the Moon, before continuing on to Talampaya National Park, another of Argentina's magnificent UNESCO World Heritage Sites. Tectonic movements and a millennia of water and wind erosion have created the amazing formations that make up the park. The traces of the first dinosaurs can be found here, thus the park’s dedication to protect the archaeological and paleontological resources of the area. In the evening , return to El Chiflon and enjoy a tasty local dinner and why not a refreshing glass of wine. Enjoy a relaxed breakfast and get ready for the journey to your unique eclipse-viewing site, where you’ll stand in the Moon’s shadow for approximately 4 minutes. Celebrate the first visible solar eclipse in Argentina with your fellow travellers at sunset before returning to your hotel in El Chiflon. This morning you will enjoy a two-hour trekking tour at El Chiflon Provincial Park. You will be picked up at your hotel by your guide making stops on the way to reach the point where you will start the walk to a viewpoint with some incredible panoramic views. The guide will be explaining everything from the type of ground and the life of the indigenous people that inhabited the place in past times to the number of condors living in the Park. Continue to La Rioja City, where traces of Greek and Roman-style architectures ordain the town. Visit the Basilica of San Nicolás, built in the Byzantine style, before heading to the house of former governor, Joaquin Víctor González, which resembles a mixture of the colonial and the medieval. Take a look at the Temple of Santo Domingo that dates back to 1623 and the Museum of Sacred Art. From La Rioja, you will continue to travel along the mythical Route 40 “Route of Adobe” through the Famatina and Sañogasta mountain ranges. Soak in the breath taking beauty of the drive through valleys and stunning canyons overlooking the river. Travel through the city of Chilecito and head on to Belen visiting the imposing “Shincal de Quimivil” an archaeological site conformed by pre-Columbian ruins of such importance that they have been declared national historical monument. El Shincal de Quimivil was an ancient city built and administered by the Incas around the fifteenth century that functioned as capital of the southern area of the empire. It was part of the Inca Trail, a network of thousands of kilometres of communication that interconnected the different territories and cities belonging to the vast domains of that civilisation. Enjoy breakfast at your hotel and spend the day traveling to Cafayate, through a landscape of cacti and natural beauty that encompasses the Santa María Valley. After crossing the Yocavil River the impressive ruins of the Quilmes open in front of our eyes. The remains of the largest pre-Hispanic settlement in Argentina whose population was defeated by the Spaniards and obliged to travel thousands of miles to Buenos Aires, and settled into what we now know as "Quilmes" quarter. You will visit the museum and the fortification erected by this community on the slopes of the hills, with an open view of the immense valley. Afterward, watch the dry desert landscape turn into fertile vineyards before you arrive in Cafayate, a grape growing area known as “The Tuscany of Argentina”. Overnight stay in Cafayate. Enjoy breakfast at your hotel and have the day at your leisure to relax and walk around the village. 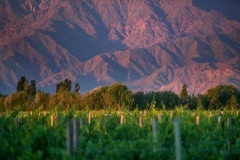 Located at 1,660m above sea level, Cafayate is well known because of its famous “torrontes “wine, product of the exquisite combination of temperature and humidity that provides the ideal environment to the growth of the sweet and deep fruit flavour. Getting to know its streets, its houses and mainly its people is a pleasant experience due to the fact that tourism is an important activity for the town. You cannot miss to observe the unique architecture of the Cathedral, the flowery main square, the picturesque stone mill or the wine museum. Wake up to breakfast at your hotel. Then, head out for a visit to the Cathedral of Nuestra Señora and some of the area’s local wineries, where you can sip on a taste of the famous “Torrontés” made of white grapes. Enjoy these local delicacies before heading out for a spectacular journey through the Las Conchas River Gorge. An UNESCO World Heritage Site, the strange rock formations are simply stunning in front of the backdrop of multi-coloured hills. Make sure you’ve got your camera with you! As you continue on your journey, drive though many small villages such as Alemania, Ampascachi, Coronel Moldes and El Carril. In the afternoon, arrive at your hotel in Salta relax after a long journey! Wake up early for your departure towards the imposing Quebrada de Humahuaca, professed as Humanity Heritage by UNESCO. The landscape is simply heavenly, as the Río Grande flows through archaeological beds surrounded by colourful hills. Your first stop of the day is in the village of Purmamarca, at the base of the “Mount of the Seven Colours”. Visit the area’s colonial villages, such as Maimará, Huacalera, Pucará, Uquia, during which you will cross the Tropic of Capricorn. On the way back to Salta in the afternoon, stop and see the main sites of San Salvador de Jujuy, such as the Cathedral, the Old Cabildo, and the Government House. When you arrive in Salta, spend the rest of the day at your leisure. Get up with the sun and take advantage of a special opportunity. Visit the high mountain archaeological museum (MAAM), which features three Inca mummy children that were discovered in 1999 in the ancient Inca civilization of Llullaillaco, the third highest active volcano in the world. In the afternoon, head to the airport in Salta, where you will board your flight back to Buenos Aires. Upon arrival, your guide will meet you and transfer you to your selected hotel. Buenos Aires' nightlife provides the local porteños and its ever-growing swarm of visitors with a seemingly endless array of quality entertainment options. Just as an example: this evening you'll be blown away by an unforgettable tango show performed by the best dancers and singers of this seductive genre, while tucking into a dinner no less seductive. This is the way one ought to live Buenos Aires, the city of tango. After the show has dazzled you sufficiently, you will be transferred back to your comfy hotel. After your last sumptuous breakfast, make sure you save some time to buy your last-minute souvenirs and/or photos. At the scheduled time, you'll be picked up from your hotel to be transferred to Ezeiza International Airport to board your flight back home.